Nigeria's minister of Finance, Kemi Adeosun is currently embroiled in a serious certificate scandal. Adeosun is alleged to have forged her National Youth Service Corps Certificate (NYSC). According to reports, the Minister did not participate in the mandatory one-year national youth service scheme. Instead, she allegedly forged an exemption certificate many years after graduation. 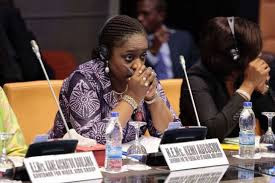 Premium Times reports that Mrs. Adeosun’s official credentials show that the minister parades a purported NYSC exemption certificate, which was issued in September 2009, granting her exemption from the mandatory service on account of age. An official of the NYSC also described the certificate as an 'Oluwole Certificate' adding that they "did not issue it and we could not have issued it". Oluwole is a location in Lagos where fraudsters possess an amazing dexterity in the act of forging all kinds of documents. It was gathered that the national assembly is aware of it and they are using it to blackmail her, to release money to them as they want. Is this for real? We'll know more soon enough.